If your crafting project needs a touch of the rustic, burlap ribbon is the look of choice right now. Burlap ribbon allows you to skip all the nasty cutting and fraying that is part of working with traditional fabric, and it comes in dozens of colors and widths. In this article, we’ve rounded up some of the best burlap ribbon DIY ideas from around the internet. These seven projects can inspire your creativity and brighten up your work and home. The burlap wreath is a project with so much versatility, you can find tons of variations around the internet. This classic version is a great jumping off point that allows you to embellish and decorate to your heart’s desire. All you need is a wire hanger and 10 yards of 5 inch burlap ribbon. You’ll simply form the hanger into a circle, then poke the end through the corner of the ribbon. Next you insert the hanger on the opposite side of the ribbon about 4 inches from the previous hole. Keep doing that until your entire hanger is covered. To finish, just fold the end of the ribbon under. These little rosettes are a great addition to hair accessories, wreaths, garlands, and more. They’re super simple to make, and you can change the size by varying the width of the ribbon you use. To make the rosettes, you’ll need a hot glue gun and a length of burlap ribbon. You’ll start by folding the ribbon in half twice, then rolling the end around itself three times to create the center. Twist the remainder of the ribbon length, then roll it around the center until your rosette reaches the size you want. Finish by hot gluing the rosette’s base to another piece of burlap ribbon, then cutting around the base to create a circle. If you’re looking for a DIY that takes essentially no time and yields an impressive result, then using burlap ribbon to add an extra element to gift wrapping is for you. This Christmas version is an excellent visual for one method, but this DIY is only limited by your own imagination. To create the look in the picture, wrap a gift in brown paper. Then, wrap twine around the width of the gift several times and tie it off. 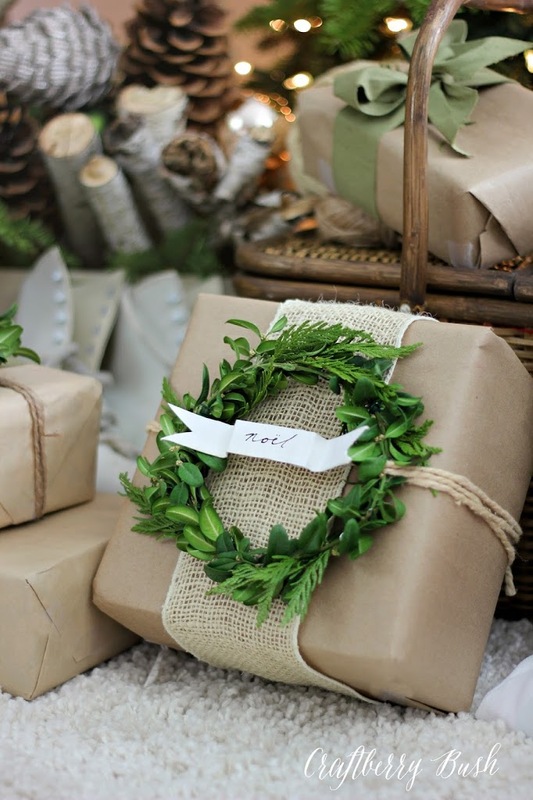 Wrap a 2 inch wide piece of burlap ribbon around the length of the gift and secure with glue. Last, glue a mini-wreath on top of the gift, and a small banner on top of that. This burlap and lace garland DIY makes a beautiful backdrop for a photo booth or a wedding, and it couldn’t be easier to make. All you’ll need is three 6’ strips of three different kinds of ribbon. The pictures uses two kinds of 3 inch burlap ribbon (traditional and open weave), and 3 inch lace ribbon. You’ll also need muslin cut into three 6 foot by 3 inch strips and a length of twine or ribbon. The cutting is the hardest part of this DIY. Once you have your burlap, lace, and fabric measured and cut, you simply tie the pieces to some string or twine, alternating different kinds of fabric to achieve the look you want. One simple way to add elegance to your table is the addition of a runner. This is a lovely and simple craft that could be changed to reflect the holiday or season. And it only takes two materials: burlap ribbon and any other type of ribbon you like. To make a springy version, start with a 5 ½ foot by 10 inch piece of burlap ribbon. Cut slits every 2.5 inches along both sides, making them just large enough to allow the accent ribbon to pass through. Then, take your accent ribbon and weave it through the slits. Simply glue the accent ribbon to the wrong side of the runner to finish. This DIY is a great way to brighten up your office space, and it’s environmentally friendly as it makes use of upcycled soup cans. You can use any material you like. Start with a clean and well-washed soup can. Line the top with electrical tape to avoid cuts from the sharp can edge. Then, hot glue a length of burlap ribbon around the can. To decorate your can, glue a rosette ribbon around the top, and a satin bow in the front. One of the beauties of this project, though, is that you can dress it up any way you’d like. Consider using different colors and styles of burlap ribbon for the base, and add buttons, flowers, rhinestones, beads, or mini-chalkboards, or more to get the look you like. If you’re looking to host in style, this burlap ribbon silverware holder is a quick and easy way to give your place settings that extra little splash of fancy. All you need for this is a length of 2-3 inch burlap ribbon and a mini-stapler. 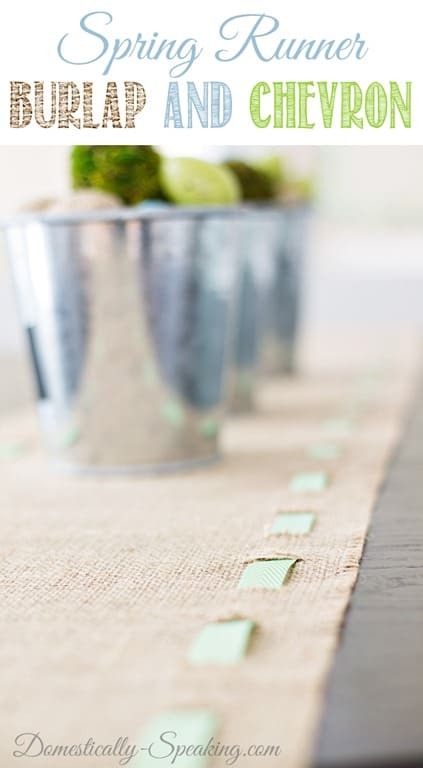 Simply lay the silverware on your burlap ribbon and mark the ribbon at whatever you deem an appropriate length. Add two inches more to your length, then cut straight across. Fold the end of your ribbon over two inches and staple down the sides using the mini-stapler. To finish, you can decorate to match the occasion, then slip your silverware inside. Burlap ribbon is an extremely versatile crafting supply that allows you to achieve all sorts of looks and designs with a minimum of effort. These 7 DIYs are just a few of the ways to use this shabby chic accessory. Did any of them inspire you? How will you use burlap ribbon in your crafting?